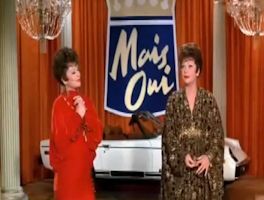 We've already had two new entries into the TV Crossover Hall Of Fame this month - the TV super channel KBEX, and the memorial tribute to Eydie Gorme (inducted with her husband Steve Lawrence). But August is the month in which we traditionally induct a TV character from one of the Westerns. And I wouldn't want to break with Tradition. If you followed the League of Themselves showcase over the month, you've seen there was one cowpoke who showed up every Tuesday. 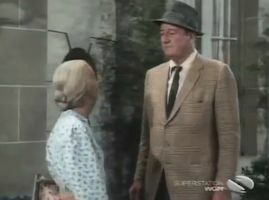 And to make it a "Two for Tuesday", we also included the episode in which he appeared as himself. It was all a lead-up to his induction into the TV Crossover Hall of Fame, one of those few times when it's an actual person and not a TV character. One reason for this is that he was better known for the Westerns he starred in for the movies. That's right, I'm talking about the Duke, Marion Morrison. 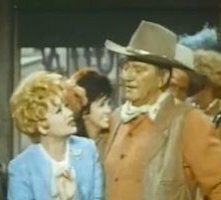 'I Love Lucy' - "Lucy And John Wayne"
'The Beverly Hillbillies' - "The Indians Are Coming"
'The Lucy Show' - "Lucy And John Wayne"
'Maude' - "Maude Meets The Duke"
'Gunsmoke' - "Matt Gets It"
If you have to be told who John Wayne is, then pardner, I feel sorry for you. 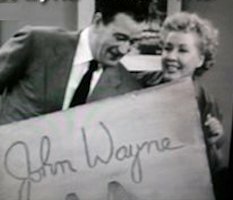 John Wayne only appeared in these five episodes as himself, but that's more than enough to qualify for membership in the TV Crossover Hall Of Fame. After all, his televersion unifies those first four in the tele-mosaic of Toobworld. So here's to you, John Wayne. 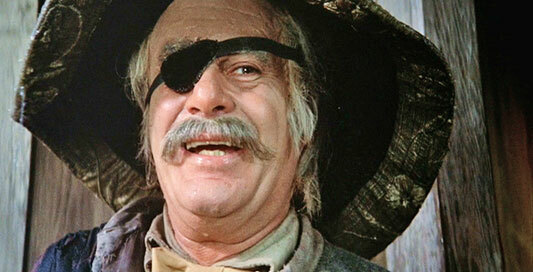 I never agreed with your politics, but there was no denying the power of your personality, whether as one of your characters like Ethan Edwards and Rooster Cogburn, or just as yourself. 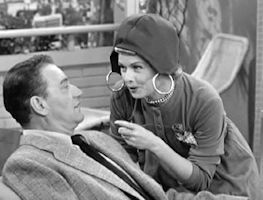 "Lucy Carter Meets Lucille Ball"
Solo investigates Brother Love, a supposed religious revivalist. In reality, Brother Love heads up a Thrush operation which has secured the services of scientists from both sides of the Iron Curtain. Brother Love is developing an atomic-powered spaceship. Solo has more than enough incentive to smash Brother Love. The religious figure abducted a woman graduate student who was sitting in a seat intended for a scientist Brother Love was courting. The student was kidnapped while with Solo. Second, Kuryakin is injured by a grenade while following the abducted Solo. 'The Man From U.N.C.L.E.' - "The Love Affair"
'The Big Valley' - "Brother Love"
"Whacking Day" is the twentieth episode of The Simpsons' fourth season, and originally aired April 29, 1993. It concerns the fictional holiday "Whacking Day", celebrated annually May 10, in which the citizens of Springfield drive snakes into the town square, then club them to death. The episode was written by John Swartzwelder and directed by Jeffrey Lynch; Barry White, who had expressed a wish to appear in the show, guest stars as himself. 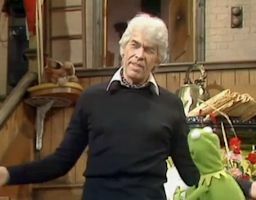 It was pitched by George Meyer, who wanted to create an episode against the mistreatment of snakes (the episode ended up winning a Genesis Award). The episode includes the first appearance of Superintendent Chalmers, and it features an Itchy & Scratchy parody of Oliver Stone's "JFK". Each year on May 10, the people of Springfield drive snakes to the center of town and beat them to death. The tradition appalls Lisa. 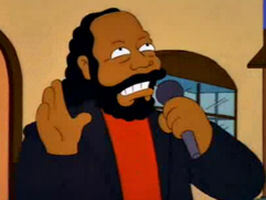 Barry White arrives to begin the festivities, but is disgusted when he discovers what the holiday is about. Bart learns the true origin of Whacking Day and suggests to Lisa that they lure the snakes to safety by playing music with a lot of bass and putting the stereo speakers to the ground. White helps by singing "Can't Get Enough of Your Love, Babe," attracting hundreds of snakes into the house. 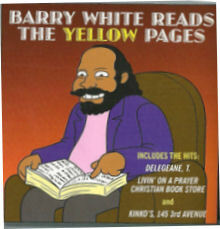 This marks Barry White's second appearance in the League of Themselves showcase. He was previously featured for Valentine's Day. 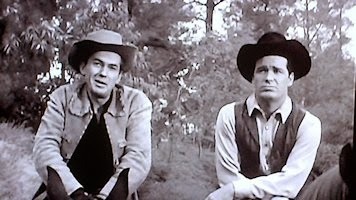 TV ON TV - "FRONTIER GAL"
When TV Westerns were at their height in the 1950s, the same held true in Earth Prime-Time. 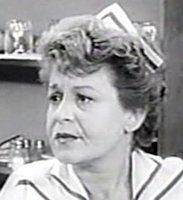 After seeing the horrendous pilot "Tales Of Tex Doberman" made by Ernie Bilko, the televersion of CBS hired Hilda, a local waitress from the Fort Baxter area, to star in a new series called 'Frontier Gal'. It's pozz'ble, just pozz'ble, that 'Frontier Gal' was based on a 1940s movie starring Yvonne DeCarlo. Michael Rubens Bloomberg (born February 14, 1942) is an American business magnate, politician and philanthropist. He is the 108th and current Mayor of New York City, having served three consecutive terms sincehis first election in 2001. With a net worth of $27 billion, he is also the 7th-richest person in the United States. He is the founder and 88% owner of Bloomberg L.P., the global financial data and media company most famous for its Bloomberg Terminal. Bloomberg began his career at the securities brokerage Salomon Brothers before forming his company in 1981 and spending the next twenty years as its Chairman and CEO. He also served as chairman of the board of trustees at his alma mater Johns Hopkins University from 1996 to 2002. 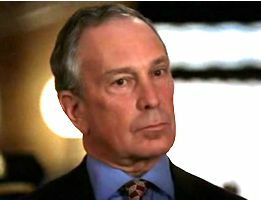 A Democrat before seeking elective office, Bloomberg switched his party registration in 2001 to run for mayor as a Republican. He defeated opponent Mark Green in a close election held just weeks after the September 11 terrorist attacks. Bloomberg won a second term in 2005 and left the Republican Party two years later. He campaigned to change the city's term limits law in the wake of the 2008 financial crisis and was elected to his third term in 2009 as an independent candidate on the Republican ballot line. He was frequently mentioned as a possible candidate for the U.S. presidential elections in 2008 and 2012, and for New York Governor in 2010. He declined to seek either office, instead opting to continue serving as Mayor of New York. 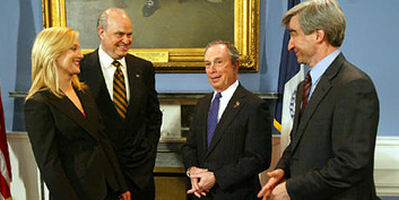 In both episodes, Bloomberg was seen at press conferences with members of the D.A. 's office. Mayor Bloomberg is a member of the TV Crossover Hall of Fame due to his appearances in 'Law & Order', '30 Rock', 'Curb Your Enthusiasm', and the Muppets' Christmas special. TV ON TV - "JED CLAYTON, U.S. MARSHALL"
Well, here we are and about time, too. If we take the north trail, we ought to be in Clayton in about four days. Clayton? If we take the south trail, we'll be in Santa Fe tomorrow! They tell me th... Oh, I remember now - Adelaide! She lives in Clayton. She does? That's quite a coincidence, isn't it? Uh-huh. Well, you give her my best. You sure you don't want to come to Clayton with me? Not even if she has a sister. I don't like to rely on actual locations for making links between shows, but when it's someplace this "O'Bscure" to the Public's general knowledge, I think we can consider Clayton City and Clayton to be one and the same. Kurt began his career as a lecturer in International Relations at the London School of Economics. In 1989 he swapped the world of theory for a more practical experience in BBC journalism. Two weeks into the new career he had a baptism of fire covering the fall of the Berlin Wall as part of the team making the first documentary from the “wall-free” Communist East. 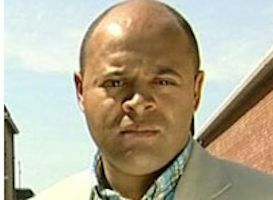 Since September 11th 2001 he has been the Special Correspondent for BBC London News where he says his Ph.D. in International Relations is being put to good use in the world’s most ethnically diverse city. "Love Means Nothing In Tennis"
At the beginning of the episode, the UCOS team watched a news report by Barling on the death of a young tennis phenom. This is the official picture of Barling for the BBC. I'll swap it out when I can find a picture of him from the episode. After Mrs. Pendrake, his honesty was downright refreshing. I've always been a big fan of Westerns, but mostly of the TV brand. And even then, I was more keen on those Westerns that had a twist to them - 'Maverick', 'Alias Smith And Jones', 'Legend', and most especially, 'The Wild, Wild West'. But I've seen my fair share of movie Westerns and consider many of them to be classics in American Cinema - "Stagecoach", "The Wild Bunch", "Rio Bravo", "The Shootist" (a particular fave), "High Noon", and "The Magnificent Seven". Even the humorous films like "Cat Ballou" and especially "Blazing Saddles" would be included in a list of the greatest movie Westerns. 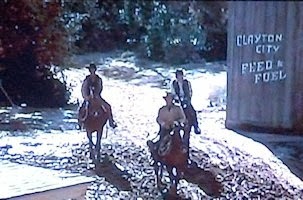 To my mind, the greatest movie Western of all would be "The Searchers". I can never understand it when "The Searchers" doesn't rank as Number One in somebody's "Best Of" list for Westerns. So "The Searchers" is my choice for the Greatest. But it's not my favorite movie Western. That "honor" goes to "Little Big Man". This is mostly due to the narrative framework. As a fan of mythology and legend, "Little Big Man" is a great example of the Tall Tale. The account of his life told by Jack Crabbe could be true - maybe he really did meet Wild Bill Hickock and General Custer - but that doesn't mean it wasn't flavored with some whoppers to embellish his story. Roger Ebert, of the Chicago Sun-Times, described "Little Big Man" as "an endlessly entertaining attempt to spin an epic in the form of yarn." And he gave it four out of four stars. but he tended to lose parts of himself. When I joined him, his left hand and his left ear were already gone. 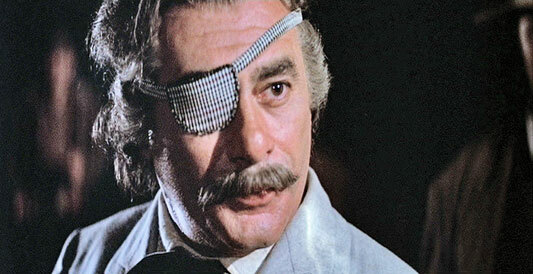 he lost an eye as a result of a fifth ace dropping out his sleeve in a poker game. It didn't faze him, though. even if it caused him to get whittled down kind of gradual like. Like I said, Americans probably don't want to admit it, but a con man like Allardyce T. Meriweather is what propelled America forward to eventually become the greatest nation on Earth. Some of the more (in)famous con men in History were Frank Abagnale (got a movie made about him! ), Charles Ponzi, Soapy Smith, and Clifford Irving. I'm not saying they should be admired or emulated, but they certainly made life more colorful. As with any mythological tale of the Joseph Campbell stripe, "Little Big Man" has its mentors to the hero. Mr. Meriweather serves as the Trickster/Mentor, weaving in and out of the story in order to guide Jack Crabbe forward in his development, even if it doesn't always feel like he's doing any good for Jack. You don't know when you're licked! I'm tarred and feathered, that's all. The American West was too long idealized in the movies - look how long it took before the image Custer as Hero was finally put to rest. 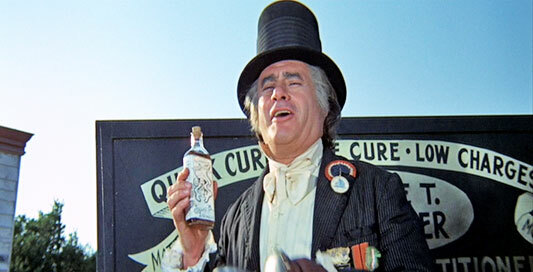 But the Medicine Show Man is probably still seen as just the "snake-oil salesman": a venal, larcenous individual always up to no good. But they were the ones who inspired the dreams in their marks - er, customers, and if those people were burned by some get rich quick scheme, maybe it made them more determined to better their situation on their own. Life contains a particle of risk. That's the role Allardyce T. Meriweather played in Jack Crabbe's life. and the two-legged creature schemes and dreams beneath them, all in vain. Whales speak French at the bottom of the sea. The horses of Arabia have silver wings. Pygmies mate with elephants in darkest Africa. I have sold all those propositions. As an actor, Balsam was more of an urban Everyman on either side of the Law, even when he was playing military characters or foreigners. 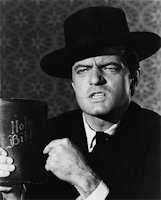 He made few Westerns, and most of those were a handful of appearances in TV oaters. As far as I can tell, the only other major Western movies he did were "Hombre" and "The Good Guys And The Bad Guys". But I could be wrong. I wouldn't be surprised. I usually am. But I think that even though he didn't have the flashiest role in "Little Big Man" (I think Richard Mulligan nabbed that title for himself), nor is he the one you come away with being most impressed by their character (Chief Dan George, perhaps? ), I think in the long run it's Allardyce T. Meriweather who sums up the quintessential figure of Americana. Most of my regular readers know that I usually focus on what I call Toobworld - that alternate reality in which everything that happens on TV actually happens. 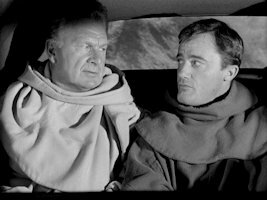 And that's another reason I wanted to write about Allardyce T. Meriweather on the day that TCM is celebrating the movie career of Martin Balsam. I think "Little Big Man", like "M*A*S*H", could have been transformed from book to movie to TV series. And the focus should have been on the relationship between Jack Crabbe and Allardyce T. Meriweather as they travel the Western frontier in search of adventure... and new marks to swindle. Even today, I think the book would be a wonderful candidate for a television remake, although sadly not with Mr. Balsam's involvement. Unfortunately, the entire episode is not available on YouTube. However, I'm sure this embed from Hulu will work - at least for a little while. (They always seem to have a limited shelf life.) But should you come to this blog post in the future and the embed no longer works, just click here for the link. 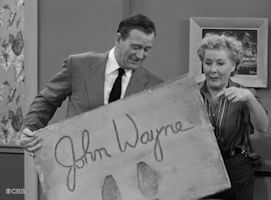 This episode is the sequel to the previous week's episode where Lucille Ball and Vivian Vance got the bright idea to take John Wayne's cement block footprints for a souvenir of Hollywood. It's certainly a more durable souvenir you would think that the grapefruit she took from Richard Widmark's orchard in a previous episode. But of course the nasty old police get involved as the theft is considered news. And of course Desi Arnaz suspects his movie star crazy wife. 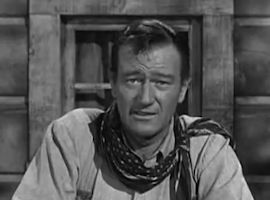 But they're dropped and shatter and the rest of the episode is spent trying to get John Wayne to donate his footprints without his suspicion. He and Arnaz at different points get a face full of cement as Lucy visits the set of the film he's currently shooting which is Blood Alley. It all gets resolved in the end by the rather exasperated Duke and the harried Desi. 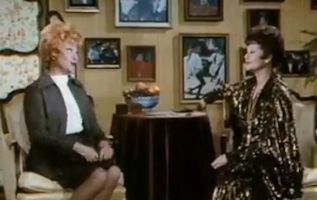 This episode shares the same title as used in 'The Lucy Show' eleven years later. It makes sense since it sums up the premise so simply - what more do you need than to know the Duke gets mixed up with that crazy redhead? When a pair of Lycaenops were on the hunt through a college campus, a student who lived in the Radcliffe House dormitory was stalked and nearly killed by one of the beasties. All of them are long dead, usually a prerequisite to get a building named after one's self. But they were all from the Eastern seaboard of Canada, whereas the university was somewhere in the general vicinity of Vancouver, but definitely out West. Maybe I have a few Canadian visitors to the blog who might have a better idea for whom the dormitory was named.....? 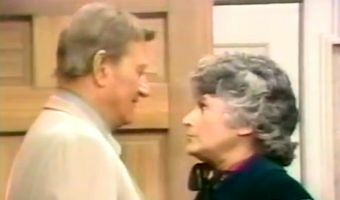 "Milton Berle Hides Out At The Ricardos"
This marks Mr. Television's third appearance in the League of Themselves spotlight this year. 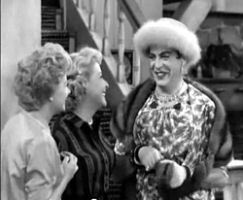 He was the second Two for Tuesday showcase in January, with his appearances on 'The Lucy Show' and 'The Joey Bishop Show'. Just wanted to let you know that I made it through the surgery okay and was out of the hospital two days later. I am now convalescing at my sister's home for the next two months. Take care! So that one is probably Coburn as himself. But with these two commercials, I think he may be the ghost of one of James Coburn's TV characters, possibly Deputy Sheriff Kell from 'Cheyenne' - "Trouble Street". Otherwise, why would a cowboy be hanging out at a waterfront dive (although it could also be a back alley gay bar, considering the times.....) There was also another commercial where the Cowboy showed up at an Oktoberfest celebration.